Unlike flawed human drummers, this Arduino powered robotic drum kit never slows down or speeds up! 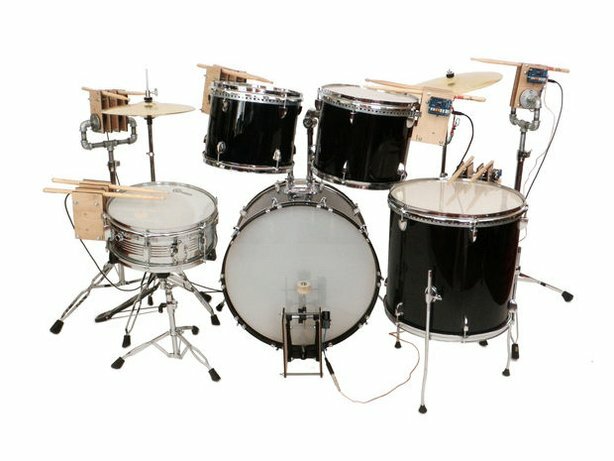 Randofo from instructables has modified his entire drum kit so that it can be controlled over USB on his computer. The drum kit has a one set of motor controlled drumsticks for each drum or cymbal. Each of these sets of drumsticks is controlled using an Arduino Uno and a motor shield. This is a very impressive project, but also a project that is certainly able to be completed by someone willing to put int the time and effort. The results definitely are fantastic! To find out more check out the following link. When you use motors in your Arduino project you will almost certainly need a H-Bridge motor driver. A H-Bridge allows you to easily control the direction of your motors from within your code. The Freetronics Dual Channel H-Bridge Motor Driver Shield is a perfect solution to this problem, allowing you to drive two DC motors or a stepper motor. The Dual Channel H-Bridge Motor Driver Shield features PWM control, selectable current limits and a prototyping area to add your own parts. To find out more check out the Dual Channel H-Bridge Motor Driver Shield page.